Prepared by Ashu Sharma, MD and Evan H. Dillon, MD , Department of Radiology, Lenox Hill Hospital; and Frank Bieuei, MD , Department of Pathology, North Shore University Hospital, New York, NY. A 48-year-old man presented to the hospital with gross painless hematuria. He underwent a radiologic evaluation, including renal sonography and computed tomography (CT) of the abdomen and pelvis. These studies indicated a solid mass in the mid- to lower-pole of the right kidney. Chest radiographs revealed a right-sided aortic arch, deviation of the trachea to the left, and an abnormal left pulmonary branching pattern. During his hospital stay, the patient developed shortness of breath and underwent a ventilation-perfusion scan. This revealed absent perfusion of the left lung with diminished ventilation. The study was interpreted as suspicious for a pulmonary embolism to the left pulmonary artery. 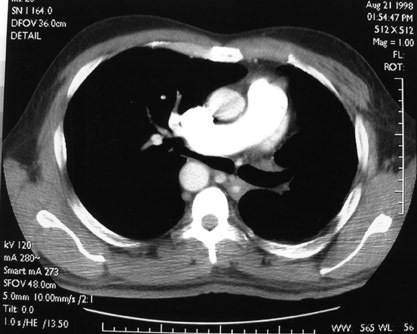 A contrast-enhanced CT of the chest using a pulmonary embolism protocol was then performed (Figure 1). Contrast-enhanced CT scans of the chest (Figure 1) reveal agenesis of the left pulmonary artery, a hypoplastic left lung perfused by bronchial collaterals, unilateral emphysema involving the left lung, and a right-sided aortic arch with aberrant origin of the left subclavian artery. The patient subsequently underwent a radical nephrectomy that revealed renal cell carcinoma. Postoperatively, he developed progressive pulmonary infiltrates, which were more evident on the right side with evidence of bronchial occlusion. He was placed on a ventilator, but eventually died due to cardiac arrythmia, despite resuscitation efforts. At autopsy in this patient, the aortic arch was found to be right-sided with aberrant origin of the left subclavian artery. A patent ductus arteriosus with right ventricular hypertrophy was seen. The left pulmonary artery was absent, and bronchial collaterals were found to be supplying the left lung. The left lung was hypoplastic, with evidence of bullous emphysematous changes and fibrosis (Figure 2). The right lung displayed changes consistent with acute respiratory distress syndrome. Congenital absence of a pulmonary artery can affect either the right or left side; it was first described by Fraentzel in 1868. 1 In his initial report, he indicated that 30% of patients with this finding could remain asymptomatic until adult life. To date, 168 to 170 patients with this disease have been described in the literature. 2 This case is unusual because imaging observations have been correlated with autopsy findings. Left pulmonary artery agenesis has been reported with a variety of cardiac malformations and usually presents with symptomatic disease. 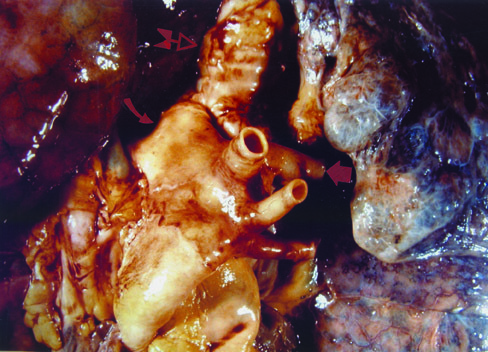 The associated cardiac malformations include tetralogy of Fallot, atrial septal defect, coarctation of aorta, right aortic arch, and Eisenmenger's syndrome. 3 Rarely, this abnormality has been reported in combination with patent ductus arteriosus. 4 Absent right pulmonary artery is more commonly present as an isolated, asymptomatic finding without associated congenital cardiac malformations. In the case reported here, an adult patient was diagnosed with asymptomatic left pulmonary artery agenesis in combination with hypoplasia of the left lung, right aortic arch, and patent ductus arteriosus on the basis of the CT scan. According to previously published reports, isolated pulmonary artery agenesis can present clinically in a variety of ways. In a recent series, Bouros et al 5 described 6 cases of isolated pulmonary artery agenesis in adulthood. Only 1 case was asymptomatic, while the others had recurrent respiratory tract infections. Additionally, 1 patient had hemoptysis and dyspnea. 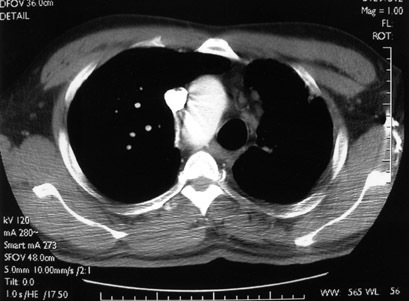 Chest radiography findings may include absence of pulmonary markings on the affected side, displacement of cardiac and mediastinal shadow, elevation of the diaphragm on the affected side, and contralateral lung hyperinflation. 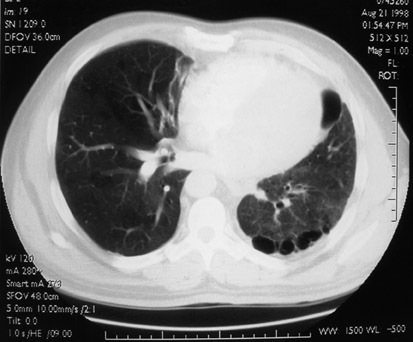 Ventilation-perfusion scans usually reveal absence of lung perfusion on the affected side. On CT scans, absence of the affected pulmonary artery is observed. The affected lung is usually supplied by systemic vasculature including bronchial, subclavian, intercostal, and subdiaphragmatic branches. In this case, the collateral circulation involved bronchial arteries. Other evaluation techniques, including physiologic measurements, cardiac catheterization, pulmonary angiography, and magnetic resonance imaging, have also been used to diagnose this condition. 5 However, as this case illustrated, a CT scan is quite useful in revealing the features of this disorder. Rarely, left pulmonary artery agenesis in combination with patent ductus arteriosus can present as an asymptomatic condition in adult life. Characteristic findings on contrast-enhanced CT allow accurate characterization of the anomaly. Agenesis of the left pulmonary artery, with patent ductus arteriosus and hypoplasia of the left lung. Appl Radiol.